Getting creative: meaningful visual representations of learning outcomes – University of Leicester. Whilst these sources may be focused more on learning objectives at the compulsory schooling levels, there are some ideas that I think have a lot of scope to be useful for presenting learning outcomes (as opposed to objectives – there is a difference) to HE students. These particular ideas centre around learning outcomes being presented in much more visual and graphic/image-based ways. The vast amount of info-graphics now being created and shared (tweeted and retweeted!) show that people find this sort of presentation of ideas, information and/or concepts very appealing. However, I would like to focus on other ideas that could help to convey further meaningful information to students about their learning outcomes. 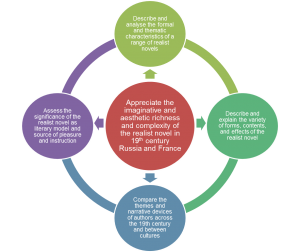 Centre red circle – Appreciate the imaginative and aesthetic richness and complexity of the realist novel in 19th century Russia and France. Light green circle -Describe and analyse the formal and thematic characteristics of a range of realist novels. Darker green circle -Describe and explain the variety of forms, contents, and effects of the realist novel. Blue circle – Compare the themes and narrative devices of authors across the 19th century and between cultures. Purple circle -Assess the significance of the realist novel as a literary model and source of pleasure and instruction. What this diagram illustrates is a way of presenting learning outcomes that show how they are related to a much broader focus of the module, which is probably what the tutor ultimately hopes that his or her students would have gained by the end of the module. This broader outcome is not one that is going to be assessed like the outer circle-based ones should be. 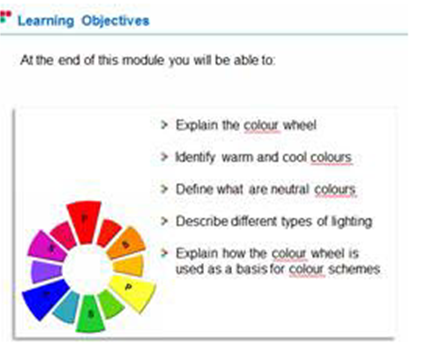 Instead, it gives a more holistic and cohesive picture to the student about the nature of the module. It gives a sense of ‘this is what we’re doing this learning for…this is what you will gain by working towards these specific learning outcomes’. The diagram also shows that each learning outcome is not a separate, isolated element, but is a part of this cohesive picture – they all relate to one another and together will help the student to achieve the central element. By emphasizing concrete language in [student learning outcomes], the specification of student learning outcomes is sometimes seen as demeaning academic content to “factory skills.” It is difficult to measure, for example, “appreciation of a discipline” or “respect for clients.” Nevertheless, if a goal in a literature course is to “cultivate an appreciation of Victorian literature,” then it is possible for this to be stated as a learning outcome that links assessment and preparatory activities. For example, “Identify a Victorian novel not covered in this course, explain the traits that define it as Victorian, and evaluate its level of interest to a modern audience”. These skills reveal the student’s “appreciation” of the topic. This quote reinforces my argument in another blog post that scholars are ‘misunderstanding’ the learning outcomes paradigm if they think that it is one that avoids ‘appreciation’ and ‘understanding’. My diagram above shows how these concepts can actually be at the heart of every learning outcome that is devised. The above image relates to learning objectives and is perhaps focusing on school-based learning. However, I think this idea has potential for use with learning outcomes in HE. Particularly, representing learning outcomes in this continuum-based way would encourage outcomes not to be seen in isolation to a module or course’s marking criteria and it would emphasise that there are different levels at which a learning outcome could be achieved. Therefore, whilst all students may achieve a specific learning outcome, there are some who may achieve it to a far higher level. This distinction of levels within a learning outcome could help to reinforce the responsibility that the student has to achieve their learning outcomes at a high level (and so gain higher marks) rather than just at the minimum level to pass. 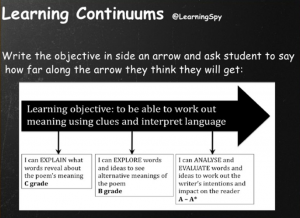 Additionally, if learning outcomes were linked to marking criteria in this way, it may help to facilitate more meaningful feedback for students and discussions with them about why they have not achieved the grade or level that they wanted, and what they need to do to gain higher marks. 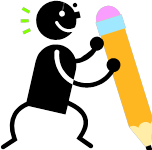 Getting creative with the presentation of learning outcomes may, at the very least, make writing them more fun for tutors. But if these outcomes can become more meaningful visual representations for the student of the learning journey to be embarked upon, it may make the whole learning outcomes approach more meaningful for tutors too.